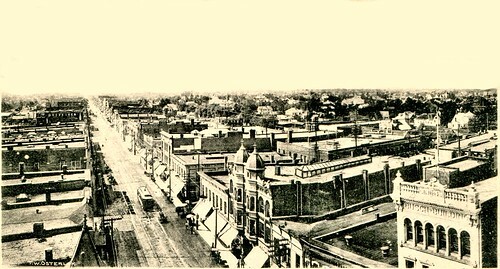 Tonight is a view of Joplin from the Keystone Hotel circa 1902 taken by resident photographer and bookseller, T.W. Osterloh. Prominent is the Columbian Block with its double cupolas and to its right, the Busch building. On the street is one of Joplin’s trolleys making its way down Main Street. Click on the image to find a larger version. This page took 0.700 seconds of computer labor to produce.